All great hosts have an arsensal of products and gadgets at their disposal. I have shelves full of crock pots, stainless steel Rival fondue pots, a Rival chocolate fountain, warming trays, buffet servers, hot pots, blenders...well you get the idea. I absolutely could not host as many parties as I do without all of these great theme party products. Some are used at every party I host, like my drink tubs and ice bucket, while others, like my fondue pots, patiently wait their turn on a storage shelf in my basement. When their time has come, I dust them off and set them up! Have you ever hosted a party and offered a chocolate fountain? It doesn't matter who you invite, kids or the most hardened adult, everybody loves a chocolate fountain. Just seeing your guests light up when they first catch a glimpse of it is worth its weight in gold. 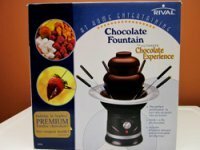 When looking for a chocolate fountain, there are a few things to keep in mind. First, most require that the base be perfectly level or the chocolate will not flow properly. Make sure you look for one that is easy to level. Of course you want to consider how much chocolate the fountain holds. My unit is the one shown here and holds up to 2 pounds of chocolate. I used mine for my daughter's high school graduation and easily fed 30 people with this unit. For home parties, this size should work for most get togethers. The last feature that I think is very important to consider is the washability of the fountain. My is not very easy to wash; it's an older model. Make sure you buy one that has dishwasher safe parts. Trust me, it is no fun trying to hand clean my unit. In addition to chocolate fountains and fondue pots, we found several other tools and gadgets every host should have in their arsenal.